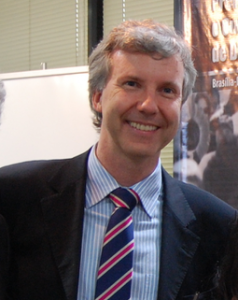 Marlon Alberto Weichert serves as Deputy Federal Ombudsman in Brazil’s Federal Public Ministry. He has been both a longtime collaborator with the Auschwitz Institute for Peace and Reconciliation and contributor to the Latin American Network for Genocide and Mass Atrocity Prevention, where he serves as one of Brazil’s Focal Points. Most recently, he participated in AIPR’s 2016 Raphael Lemkin Alumni Meeting in Venice, Italy. Since 1999, I have worked on transitional justice in Brazil, where I’ve had the opportunity to initiate the search for the human remains of disappeared politicians and the opening of secret archives, as well as the installation of memorial sites. Above all, I started the defense of the thesis that crimes against humanity took place during the military dictatorship and, as such, the State must investigate them and prosecute the perpetrators. Little by little, I took part in other activities related to the prevention and fight against grave violations of human rights, working at the Office of the National Ombudsman, which, in Brazil, is a body within the Office of the Prosecutor General. Which actions and/or policies do you feel are the most effective in the long-term prevention of mass atrocities? Everything related to education, but not formal education. It’s indispensable to develop strategies through which educational processes develop citizens, and not only teach them technical skills. A society committed to human rights is one in which every member, of the different social and political spheres, respects human rights and – through their activities – promotes the essential values of human coexistence. It is not possible for more than 60 years to have passed since the Holocaust and for democracies to have not been capable of consolidating non-discrimination and respect for differences as a governing principle in society. To me this is a failure of formal education. What advice would you give to a new government official who has just begun work in the field of genocide prevention? First, that they know about the past and about why genocides have taken place. Second, and most importantly, I would advise them to approach the populations that are the most susceptible to suffering mass atrocities. It’s essential that they listen to these populations and keep their door open to them. What do you feel the most proud of in your work with the Latin American Network for Genocide and Mass Atrocity Prevention? What do you see as the strengths of the Network and how can they be publicized in the near future? The Network has created the opportunity for learning through the experiences of other countries. Promoting cooperation and exchange is its strength and I am proud to belong to this group. I believe the Network has many possibilities for strengthening prevention in the region, especially through more multilateral cooperation. Who or what motivates and inspires you in your work? I am inspired by the promotion of the rights of populations that are isolated from the development that the economic system provides. That is to say: working in favor of those that are at the margins of our society, especially minorities who are discriminated against.